Tonight @SenSanders will host a conversation about #MedicareForAll. @SenSanders if #MedicareForAll is implemented, how many people will lose their current coverage? Answer: EVERYONE with private coverage. Now, as you've guessed, Barrasso is a Republican. Fine. We're used to partisan warfare around these parts, and much of it is dishonest. But even by Republican standards, this is insane. 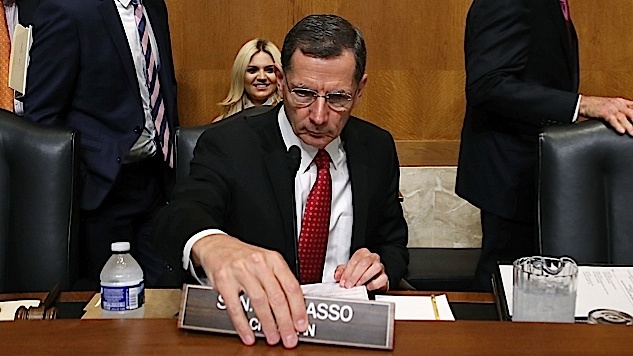 Yes, Sen. Barrasso. Yes, people will lose their current coverage. And they will gain government health insurance, you stupid $(%&$#$)#($ )#$#). It doesn't matter that they lose whatever private insurance they have, because it would be redundant! That's the point of it! That's the point of Medicare for all! Everyone will have health insurance that is free at point of service! It will be paid for by taxes! There are about 44 million people in this country with no insurance, and 38 million with inadequate insurance, so the net gain will be 82 million people getting better insurance! THIS IS SUCH A DUMB, BAD, DUMB-BAD TWEET. THEY WILL HAVE GOVERNMENT COVERAGE. THEY WILL NOT NEED ANYTHING ELSE. GODDDD. As one user on Twitter noted—and this is the least surprising news ever—Barrasso gets a ton of money from the insurance and pharmaceutical industries. That explains the propaganda…but again, it doesn’t explain the sheer dishonest idiocy of the tweet. Below, you can watch Bernie Sanders’ town hall from Tuesday night on the concept of Medicare for all. Catch a few minutes, at least—after consuming the tweets above, you need a palate cleanser.